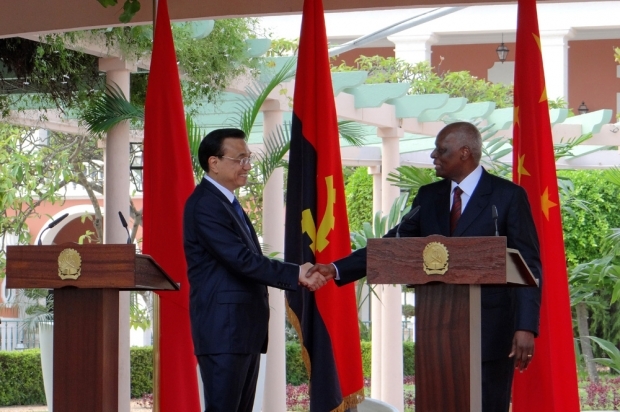 Chinese Prime Minister Li Keqiang, left, and Angolan President Jose Eduardo dos Santos shake hands on May 9, 2014 in the gardens of the Angolan presidential palace in Luanda, at the end of a joint press conference to mark the closure of Li’s two-day official visit to the country. Publicly, China's engagement in Africa is purportedly based on “mutual benefit” or, as Chinese officials like to phrase it “win win.” Behind the scenes, though, it's a little more complicated. Many of those multibillion-dollar natural resource-for-infrastructure deals have been arranged by mysterious middlemen like Sam Pa and his Hong Kong-based Queensway Group. These go-betweens, according to reporting from the Financial Times’ Tom Burgis, often do not live up to Beijing’s lofty ideals, as the overwhelming majority of African people see little from the fruits of these deals while politicians, brokers, and other elites pocket millions in profits.